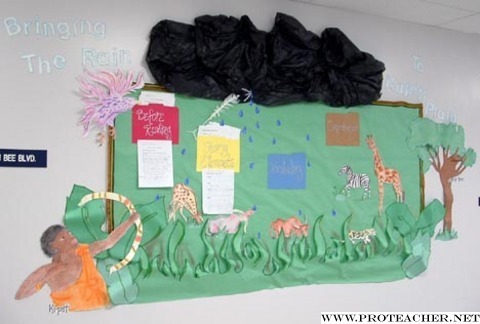 This bulletin board was created to display the ongoing work of our 2nd and 3rd grade students. My colleague Dee and I are reading the book "Bringing the Rain to Kapiti Plain" with the students. In a few weeks the students will perform the book by doing a choral reading. Instead of just displaying the work of the students I decided to be creative. I drew different characters from the book and made sure I depicted the important events.We used construction paper to create the plain and the animals were drawn with pastels and watercolors. The "cloud" above the board was created using black trash bags! Students and teachers alike have been enjoying the board. The folders hold the students' work and everyone is able to browse through their work as they enjoy the colorful display. Students have even asked to leave "a little early" from class to go and look at the board. I am happy to have provided my school with something bright and fun to enjoy.